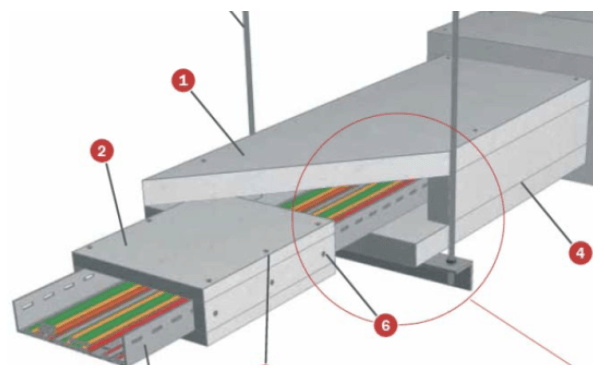 We have already talked in another post about the sealing of cable installations how to correctly seal the passage of a cable tray when passing from one sector to another, it protects the change of fire sector but not the tray itself. Sometimes the entire cable tray is requested to be protected from fire, ensuring the electrical continuity, the absence of short-circuit and grounding. This is very common in the petrochemical industry and it has already been standardized with certain systems, but it may also be necessary in all installations where a certain basic electrical or data supply is required to continue for a time in order to allow the evacuation in case Fire, such as hospitals, airports, tunnels, high building, etc. 1.- The first one consists in covering the tray with Tecbor® B panel of 40 mm and a specific support. This system has been tested under standard UNE ENV 1363-1 and American hydrocarbon heating curve UL 1709. Giving a result of TWO HOURS of electrical maintenance. 2.- The second issomewhat less aesthetic but equally effective, is to apply Tecbor Preparada® Joint Paste in both cables and tray with airless spray gun, brush or roller with a thickness of 3.6 mm to achieve also TWO HOURS of electrical maintenance and absence of both short circuit and grounding. This system has been tested under standard UNE ENV 1363-1 and heating curve UL 1709. 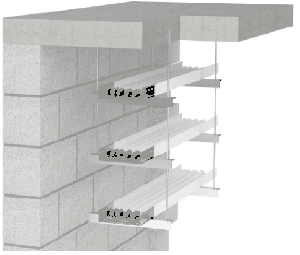 This latter system has also been tested with a smaller thickness of 2,7 mm to obtain a result of 90 minutes of maintenance of the electrical supply. This type of solution is usually used in the petrochemical industry, such as Repsol and also in electrical substations. But in facilities of Public Concurrence, high-rise buildings, tunnels and hospitals, where it is necessary to maintain certain basic electrical and data services for the evacuation of people, still in Spain its use is very scarce, perhaps due to the absence of a Specific legislation or lack of knowledge at the project level that it is possible to do it correctly.